Mondo is known for its unique take on movie posters and whether you like their style or not they always bring something new and interesting to the table. 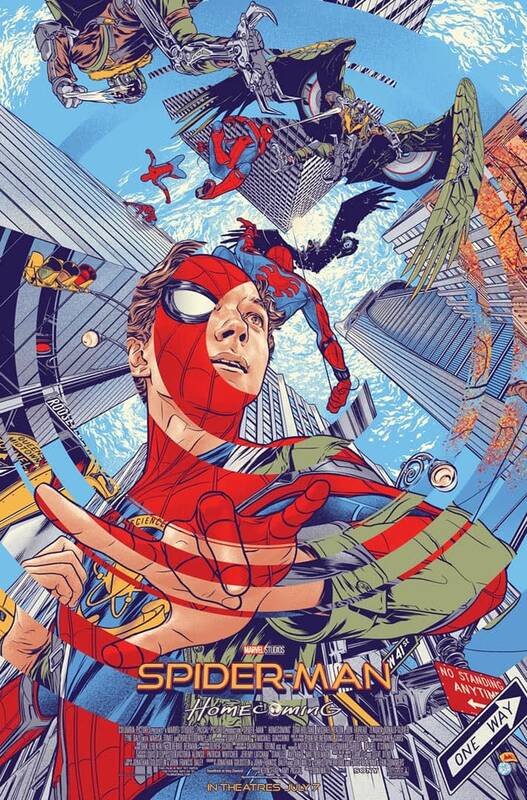 On Twitter today Sony unveiled the Spider-Man: Homecoming Mondo poster. There is a lot going on here but the chaos feels deliberate as compared to that IMAX poster we got a little while ago. The blending of Peter and the costume is some pretty obvious symbolism and Peter learning to balance his two lives is an important part of the film. The Vulture appears at various points above Peter’s head as they do battle which gives Peter in the middle of feeling that he’s surrounded on all sides. The sonar type circles could be there to represent his Spider Sense which is a possibility considering what we know about the plot. Spider-Man: Homecoming Mondo Poster is likely going to be divisive either way. Let us know what you think of the poster in the comments.